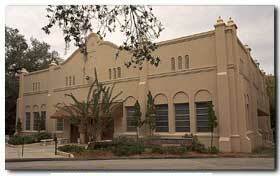 Cassadaga, Florida is about halfway between Orlando and Daytona Beach just off the I-4 corridor. The village was created by George Colby, a young man originally from New York. Almost 150 years ago, he attended a seance where he was told that some day he would help create a spiritualist community in the southern United States. Sure enough, in 1875, Colby was introduced to the wilderness of Central Florida by a spirit guide named Seneca. Colby homesteaded in the area, and in 1895 deeded 35 acres to the newly organized Cassadaga Spiritualist Camp Meeting Association. A small spring on Colby's homestead reportedly cured the tuberculosis that he had suffered from for years. The spiritualist organization still exists, and there are a couple of dozen Victorian area cottages and homes sprinkled across the grounds. Many of them are occupied by mediums, psychics and healers. 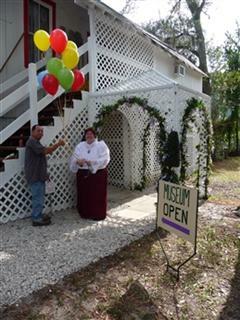 The Cassadaga Spiritualist Camp conducts church services on a year round basis. Services are held in the Colby Memorial Temple on Stevens Street. Everyone is welcome to attend the services. There are 40 Certified Mediums at Cassadaga Spiritualist Camp who give readings, and almost as many Certified Healers who help people tap into their inherent self-healing ability. The Camp has a bookstore with the area’s largest selection of books on traditional Spiritualism and Metaphysics. It also carries a large selection of tapes, CD's, crystals, stones, jewelry, Native American crafts and other unique gift items. The spiritualist camp made the National Register of Historic Places back in 1992; it may be the only time an entire town made the list. 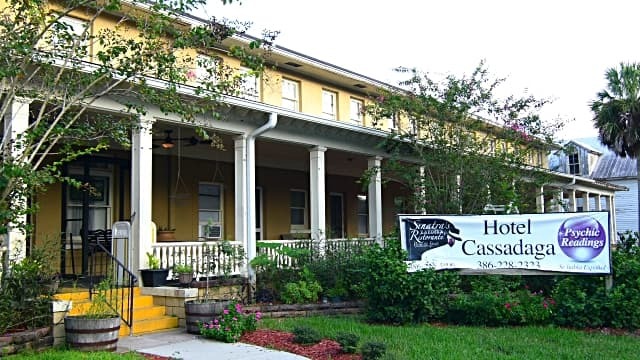 If you don't mind seeing or hearing ghosts now and then, try staying at the lovely Cassadaga Hotel right in town. It's a great place to stay while you wander around getting readings and looking at the quaint architecture of the village. And maybe you'll be visited by a friendly ghost. Cassadaga is between Orlando and Daytona Beach just off I-4. Take I-4 Exit 114. Go north on 472 toward Deland and Orange City. When you get to Martin Luther King Parkway, turn right, then turn right again on Cassadaga Road (County 4139). The camp is about 1.5 miles ahead.